TheMoonLITE (Moon Lightweight Interior and Telecoms Experiment) project is aproposed collaboration by the British government and NASA. A satellite would beplaced in orbit around the Moon carrying penetrator probes. These probes wouldbe dropped from orbit, penetrating the lunar crust. Readings fromshock-resistant instruments would be sent back to the orbiter, and then back toEarth. The MoonLITEorbiting platform would consist of a large, high thrust propulsion systemand associated support structure, including communications and navigationcapabilities. Power would be provided by a single solar array. The platformwould communicate with the penetrators at data rates ranging from 200 bps to3kbs. "Thisjoint report represents a milestone .... The [plans] provide an opportunity toharness the UK?s world-class expertise in small satellite, communication androbotic technologies focused on exploration of the Moon ... the UK is fully exploiting and strategically maximising its technological and scientificstrengths in space exploration." Constraining the origin, differentiation, internal structure, and early geological evolution of the Moon. Gaining a better understanding of the origin and history of the volatile flux in the Earth-Moon system. Collecting of ?ground truth? geochemical data for the calibration of orbiting remote-sensing instruments. Collecting in situ surface data that would help in the planning of future lunar exploration activities. Initially, the platformwould enter a 100 kilometer altitude circular orbit; it would come within 40kilometers of the surface for deployment of penetrators. Following deployment,the orbiter would move into a higher orbit to increase long-term orbitstability. 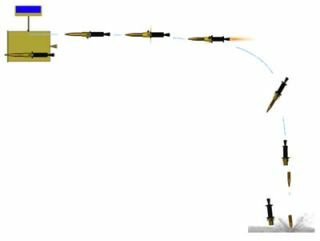 The penetratordeployment sequence proceeds as follows: after a free-fall of about 3.5minutes, the PenetratorDelivery System realigns itself to assure a near-vertical impact. The finalimpact velocity is estimated at about 350 meters per second. Sample collection and thermal control system is based on the drill and the pyrotechnic sample volume sealing device based on NASA Deep Space 2. The group believes that bydeploying instruments to a variety of carefully chosen locations never beforeexplored (including the poles and the lunar farside), MoonLITE penetrators havethe potential to make major contributions to lunar science. The mission wouldalso provide knowledge essenial to future human missions to the Moon, anddemonstrate technology that could be used elsewhere in the solar system. In his 1958 novel TheMechanical Monarch, EC Tubb writes about asteroid miners who want toknow the composition of asteroids prior to actually landing on them. They use aprojectile toblow some material into vapor, and then use spectral analysis to determinecomposition. NASA has quite a number ofpossible lunar projects on the table; see the plans to put RadioTelescopes On Moon's Farside and even a LiquidMirror Telescope for the Moon. From Joint Working Group Report on Lunar Cooperation via The Register.